Unless you’re a trust fund baby that will never need to work or a Lighthouse Keeper on a lonely bay, you’ve probably had a workplace crush on somebody somewhere at sometime. It usually comes down to the availability factor. You likely see this person more than your friends, and definitely more than the person you are dating, even though you only saw each other three times in the last two months because you’ve been so busy with work. You’ve been trying not to get caught looking at “Red Head” every time she walks into the office across the hall. You’ve been thinking of an excuse for why you need to talk to “Tall Guy” in marketing when your department has absolutely no reason to interface. In getting to know this type, remember, some of the same steps and rules that apply outside the workplace also apply within. Rule one: Things go much smoother if you both have some friends in common. So get friendly with “Red Head’s” and “Tall Guy’s” office buddies. Suggest a group lunch. If the lunch goes well, it means you realize this person is not only attractive from afar but someone you could see yourself dating. Now that you are acquaintances, use that to your advantage. Be the fun person who has a full plate and is hard to pin down. Interact with Red Hed and Tall Guy but leave them wanting more. Then casually work them into your schedule. But keep your time with them casual. If things don’t work out in the beginning, the aftermath won’t be as bad. We all know how hard it is to divvy up the circles of friends after a breakup, having to do it with co-workers, a boss and subordinates can be more difficult. After all, you do have your career to think about. The Universal Rule…Take it slow. 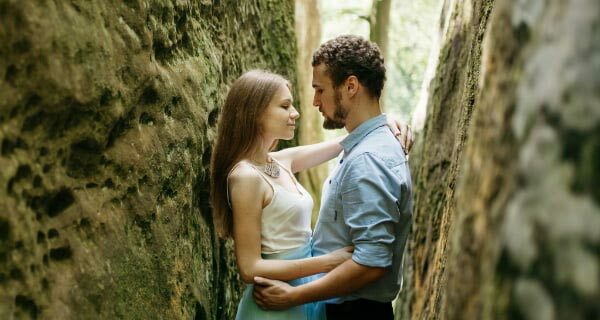 This can be applied to almost anything: putting on makeup, trimming body hair, driving through residential streets… But “taking it slow” should always be applied to workplace dating, because this dynamic creates the illusion of intimacy. You spend lots of time together in relatively close quarters, solve challenges together, you get glimpses of each other’s good and bad side, and there may even be the emergency 3 a.m. call. The workplace dynamic acts as an accelerated courtship. Get too close too fast and you are forced to deal with the aftermath while trying to complete those power points. So at the beginning of a co-worker courtship, be realistic and talk openly about your boundaries. You have a “workplace rhythm” with this person. That rhythm includes re-living a crazy office story, discussing assignments or tasks, talking about other hookups in the office, and complaining about the annoying people on your floor. When dating someone you don’t work with, these daily anecdotes drive most of the time you spend together. Now that you’re courting a co-worker, the “How was your day, Honey?” is a question that was answered during the day – many times over. Yes, you already see a lack of breathing room. The space and autonomy in a relationship is what feeds the time you spend together. Absence makes the heart grow founder, so no matter how much we care for and get along with someone, the loss of personal space can lead to ill will. Yes it’s difficult to find someone special in this fast-paced world. So if you find that someone on the job, don’t let it pass you by. Just take things slow, communicate, and be open to the reality of your situation. No matter how perfect you two may be for each other at work, it still takes a lot of work to keep the relationship going. I read on many workplace relationships….that DO work…..
…every case is different…..but there is more workplace romance going on than one might expect. Great article. “Keep it casual” and “think of your career”-great advice. I do work with a number of clients who are involved in workplace relationships and/or attractions. One of the things we work on is respecting each person’s timing and speed regarding relationships and we definitely work on remembering to protect the client’s career-especially in this economy. I do also work with clients who have a workplace attraction that is unrequited. Having said that, I have a number of clients who have met someone and established very successful relationships as a result of their work place. After all, most of us spend more time at the work place than any where else. It’s a matter of care and perspective.